It was the school holidays and Jenni (fav sis) wasn’t able to accompany me to chemo that day. She usually works on Tuesdays but had to work on Monday instead that week. My friend Simone knew someone who had Hodgkin’s lymphoma about 10 years ago and she had told Simone that she wished she’d taken different people to chemo with her, rather than the same person every time, so more people could see what it’s actually like to be given chemotherapy. (I actually thought it might be nice to take a different person to chemo each time so they could have the chemotherapy instead of me! But my PET scan results probably wouldn’t have been so good if I did that). Simone was the first person I thought of when Jenni wasn’t able to be my chemo friend that day and after confirming her mum could look after her two children for the day, she accepted the job. Poor Simone definitely drew the short straw, however. It was a long day! I met Simone about 15 years ago, maybe more, when we worked together at the good old Grand Hotel. We travelled overseas together for a few months in late 1999/early 2000 and got up to a bit of mischief. We spent New Year’s Eve on the streets of Edinburgh at “Hogmanay” which is one of the biggest New Year’s Eve events in the world and was a pretty awesome place to welcome the new millennium. We actually had more fun the next night at a little pub, chatting to some locals wearing kilts. And we found the answer to that question everyone asks – ‘do they wear underwear under their kilts?’ No, they don’t! Well at least the one we were talking to didn’t. I think I took a photo to prove it. Simone is a very caring, generous, sympathetic and empathetic person and has been a friend I have been very fortunate to have during this adventure. She put together a cancer show bag before I started chemotherapy, made me a bracelet with a ‘tree of life’ charm on it, has been to my house to cook me dinner (and drink wine), delivered many meals, and called/texted often. She was also the first one to start investigating hats and scarves. The bracelet Simone made for me. 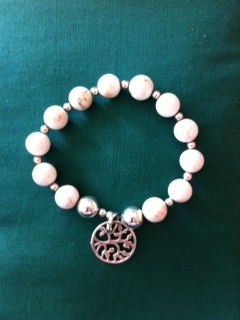 Simone sells bracelets too by the way, so if you want to order one, let me know. And you can still order those stickers from http://www.myracecarsticker.com.au I am determined to get some orders for something!! I think I’m going to go for an FUC sticker, a little more subtle than F##K CANCER. Back to the chemotherapy. Simone picked me up from home and we drove into the hospital. First stop was the chemo ward to have a blood test to see how those neutrophils were holding up. There was no visit to the haematologist prior to chemotherapy this time as my usual haematologist was still on holidays and I had seen the covering haematologist on Thursday for the results of that PET scan. Simone had been instructed by Jenni to make sure a hot lunch was ordered for me and she completed that task with stealthy efficiency. That day was a very special day as it was Karine’s (my chemo buddy) last chemotherapy. I was definitely jealous, but very happy for her. I wasn’t seated next to Karine and that was not going to be acceptable for her last session. That day was also the day I had a PICC line inserted so after the blood test, the next stop was the radiology department next door. I have mentioned in a previous post that PICC stands for Peripherally Inserted Central Catheter so it is basically a catheter that is inserted into a peripheral blood vessel (i.e. a blood vessel in a limb) and fed up to a central vessel (i.e. a large vessel near the heart). The advantage of a PICC line is that it can be left in for several months. It can be used to deliver things (i.e. chemotherapy) and also to take blood for blood tests, therefore preventing the need for multiple stabs. Also, the delivery of chemotherapy to a large, central vein would save my poor peripheral veins from further trauma and sclerosis. 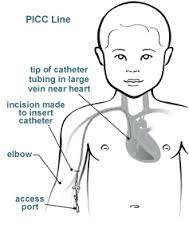 This illustrates where a PICC line is inserted and the tip in a large vessel near the heart. 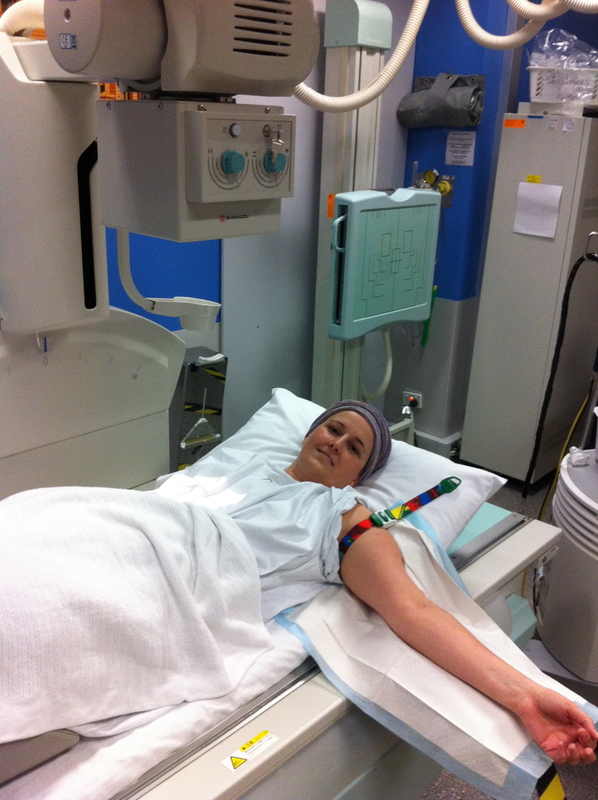 I first met the nurse who would be assisting the radiologist who would be inserting the PICC line. She was lovely. Simone told her I was doing a blog and I wanted some photos of the PICC line going in but she was a little uneasy about that. I also thought it probably wasn’t wise to have someone photographing the procedure. We didn’t want to make him nervous and have him pierce a big central vessel or my heart! 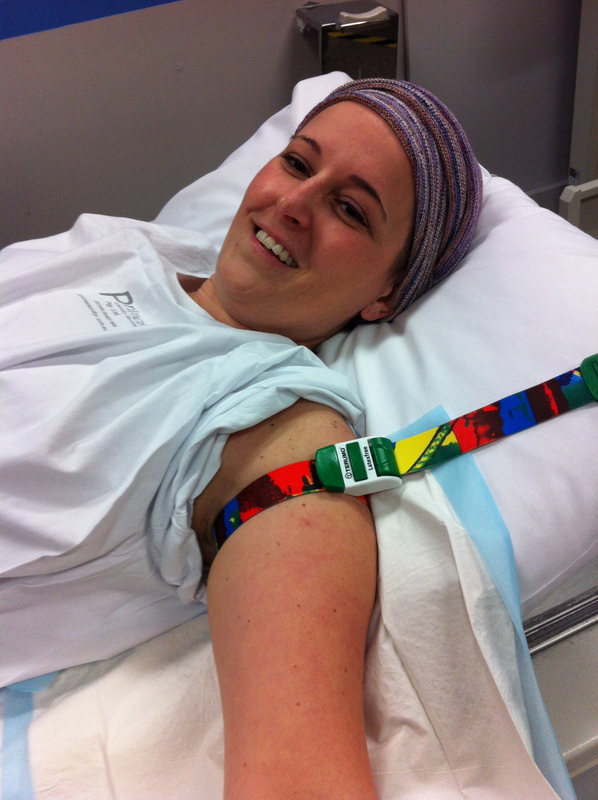 So we settled for a few photos of me lying on the table ready for the PICC line to go in. The nurse asked me which arm I’d like it in and I chose my left arm since that was the arm that already had all the stuffed veins. Might as well keep the right arm good. Ready for the PICC line. The radiologist came in and introduced himself. Also lovely. He was the husband of a work colleague so we chatted about my work and also about my radiologist friend, who I assume had lined him up to perform this procedure. He explained what the procedure would involve; injection of local anaesthetic which would be the worst part, a small incision, insertion of the catheter, threading it up to a large vessel near the heart and confirming its position radiographically. The local anaesthetic was inserted and all of a sudden I felt a hand rubbing my right shoulder. It was the nurse. Although it wasn’t really necessary, I did think it was such a nice thing to do. The local anaesthetic did sting but it was nothing compared to a bone marrow biopsy! The radiologist made the incision and inserted the catheter. He made a comment about me having royal blood because it was very blue. Perhaps I really am a princess! The catheter was threaded up the vein and the correct position of the tip was confirmed. A dressing was applied and that was it. It was all over with pretty quickly. I returned to the chemo ward ready for the chemo to be delivered through my new PICC line. I was happy to find that I had been moved and was now next to Karine, so we could chat all day during her last chemo session. My blood test results were back and I was informed that my neutrophils were 0.3. Wow! That was an all time low. Still, I wasn’t concerned because I was ‘well’ so I would be having my chemotherapy. The nurse who was looking after me said she’d have to check with the haematologist before hooking me up to chemo. I understood that but I was a little nervous as my haematologist was still on leave. I knew he would not bat an eyelid and tell them to give me the chemo but the woman who was covering him (you know the one who looked me in the eye and asked “how are you?” and who was so very positive about my PET scan results) was nice! I was just hoping she was only nice to people and not to cancer and would tell the nurses to give me my chemotherapy! The head nurse came over and told me I wouldn’t be having chemotherapy with neutrophils of 0.3. I told her I’d had chemo with neutrophils of 0.5 and 0.3 wasn’t that much lower than 0.5. She said 0.3 was very low and my chemo would be delayed for a week at that level. No chance! I had the rest of the year mapped out in terms of bad weeks (chemo weeks) and good weeks (non-chemo weeks) so throwing that out by a week would mean I would be having chemotherapy on the Monday before xmas and xmas day, being a Wednesday, would be a write off. It would also mean that the treatment for this cancer would extend into 2014. That was not going to happen. 2014 was going to be a good year. The nurse who was looking after me came back and told me they were still waiting for the covering haematologist to call back. I was happy to wait. About 10 minutes later, the nurse said the haematologist hadn’t called back so they had spoken to another doctor who sometimes covers my doctor when he he’s away, and he said I should have an injection of neulasta (a drug that makes the bone marrow produce more neutrophils) and come back on Wednesday for another blood test to see if my neutrophil level had improved. I wasn’t happy with that so I told the nurse I wanted to wait for the female haematologist to call back to see what she said. My haematologist would be back at work the next morning at 8 am so I had already decided I would be calling him at 8:01 am to get him to instruct the nurses to give me chemotherapy on Tuesday if it wasn’t going ahead today. Fortunately the female haematologist called back and told the nurses to give me chemotherapy. She also explained to them the importance of not having delays in chemotherapy in the treatment of Hodgkin’s lymphoma. I would also be earning an injection of bone pain causing Neulasta this time. The nurses apologised but I was not angry with them. I understood their concern about giving me chemotherapy with such a low neutrophil count, but I also knew I should be having chemotherapy that day. When re-telling this story to an old colleague recently, we laughed that I was possibly becoming a drug addict. Nothing was getting in the way of me having my drugs that day. It’s a little odd, because these drugs make me feel like crap and I wish I didn’t have to have them but I do not want to prolong this adventure by a single day. So, I was hooked up to chemo through my new PICC line and despite a very late start, it all went smoothly. Jenni came to visit on her way to work to wish Karine well on her last chemotherapy, (and to check that Simone had ordered my hot lunch). I am so glad I met Karine, although in a way I wish I’d never met her as both of us having cancer is the reason we met. The chemotherapy sessions were almost fun with Karine there. She was a breath of fresh air and made Jenni and myself laugh often with her honesty and sense of humour. We met her mum, her friends and her husband, as she had a different ‘chemo friend’ each time, and we learnt a lot about her through the stories she told us. Karine is also participating in the weekend to end women’s cancers but unfortunately she is not a member of ‘The Good Tittie Team’. I guess we’re all on the same team really, raising money for the same cause. I wish Karine all the very best in her life after cancer. It won’t be the same but she’s a strong, happy person and she will be fine. We’re Facebook friends now and I think we can call ourselves real friends too. I am sure we will keep in touch. Karine and I in our gold class chairs, in the naughty corner, hooked up to chemo, for the very last time for Karine. Simone and I didn’t leave until nearly 5 pm which is the latest finish I have had. It was a long day but it was another chemo down. Seven to go. Very well said although I think you’ve made me sound like a prison warden in this one! By the way, nobody has ordered a sticker yet!! I ordered one ages ago Jenni. But I’ll change it to the more sedate FUC cancer like Mel. You are belting them out now. Good luck Karine in your walk and the future. 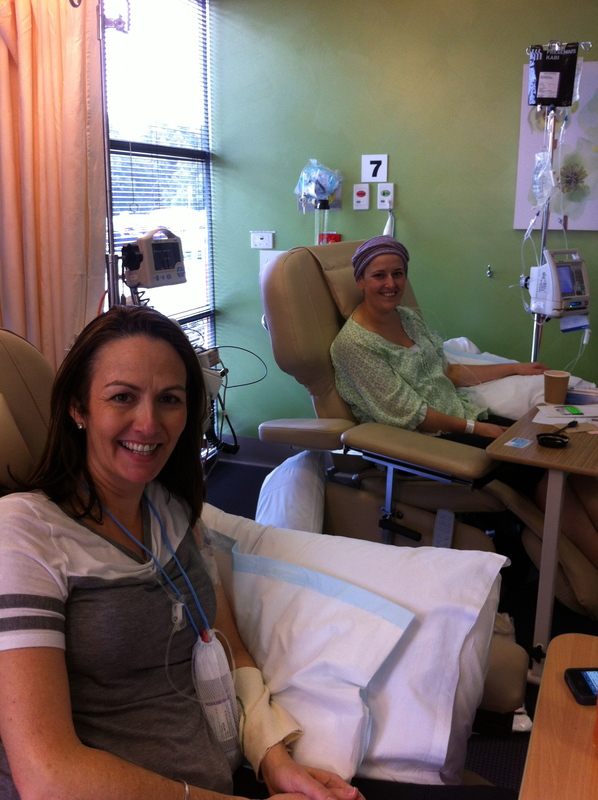 Glad I’m not the nurse that tells you you can’t have chemo today – wonder if they were drawing straws!! ….. Good to hear you are staying strong baker – we are all thinking of you.